Loved this series, however not this book as much as the last 3 books. As others have stated, it just seemed redundant, tired, and a little predictable. I love this series. 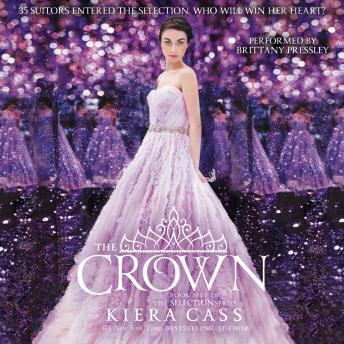 I started with The Selection and finished with the Crown and I feel that the stories flowed well, had interesting characters, and held my interests on my long car rides. I love this narrator. She did a great job! This book is amazing, another great book in the Selection series!! I enjoyed the book. It was a good book to go out on a walk and not have to catch every word. It is a book that you can just enjoy and not have to worry about over thinking. It would have been nice is the narration would have been done by the same person for each book. Not super impressed, seems like the author was tired of the plot. Whole chapters of the book read like exact excerpts from previous books in the series. It must not have been horrible though...I listened to the whole thing!! !